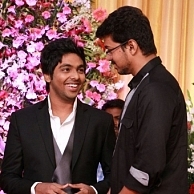 The wedding reception of GV Prakash and Saindhavi was held in a very grand manner at the Mayor Ramanathan Chettiar Hall in Chennai, on June 27. The wedding preceded the reception, in the morning. The reception saw attendance from many industry bigwigs led by director K Balachander, Ilayathalapathy Vijay, Amala Paul, Shalini, Shamili, Kalaipuli Thanu, Manobala, Sneha, Prasanna, Mohan, Vasantha Balan, Parthiban and many more. It sure was one of the biggest events in recent times and the newlywed couple was happy to receive all these illustrious guests and their wishes. Behindwoods joins them in wishing GV and Saindhavi a long and happy married life ahead. It's Birthday Bumps Time For GV ! Thalaivaa To Strike A Day Earlier Than Planned! A Song About Putting 'kadalai' On Facebook!